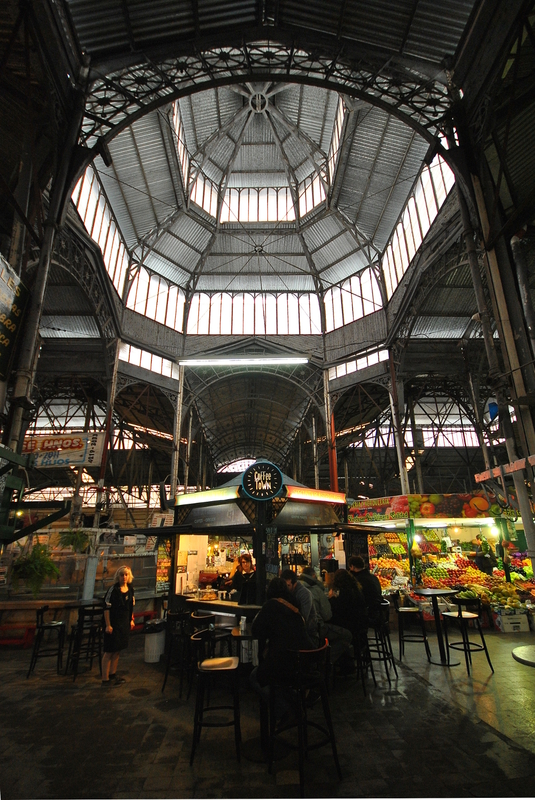 A coffee shop stands at the center of San Telmo market, where one can buy everything from antique telescopes to bibb lettuce. Tomorrow Tabula Rasa, BentBottle and I head over to the local public library to hang our photos in their gallery for our first public showing of our work. I’m a little excited and am finding this to be a new sort of terrifying fun. All these years of photographing Gary Indiana and other locations, all the hours of driving, all the asbestos exposure, the mold inhaled, and scary moments are being distilled down into 10 images from each photographer with a book of our runner-up photos on the side. I’m not sure what I am expecting from this showing, but it’ll be interesting. As some readers may have gleaned over time, neither of the authors of this blog are particularly religious, to put things gently. 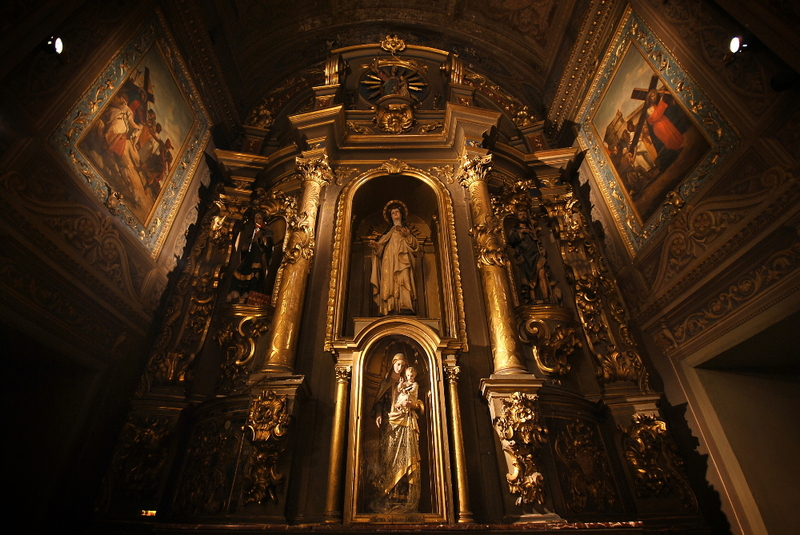 However, we both enjoy churches, both abandoned and not. 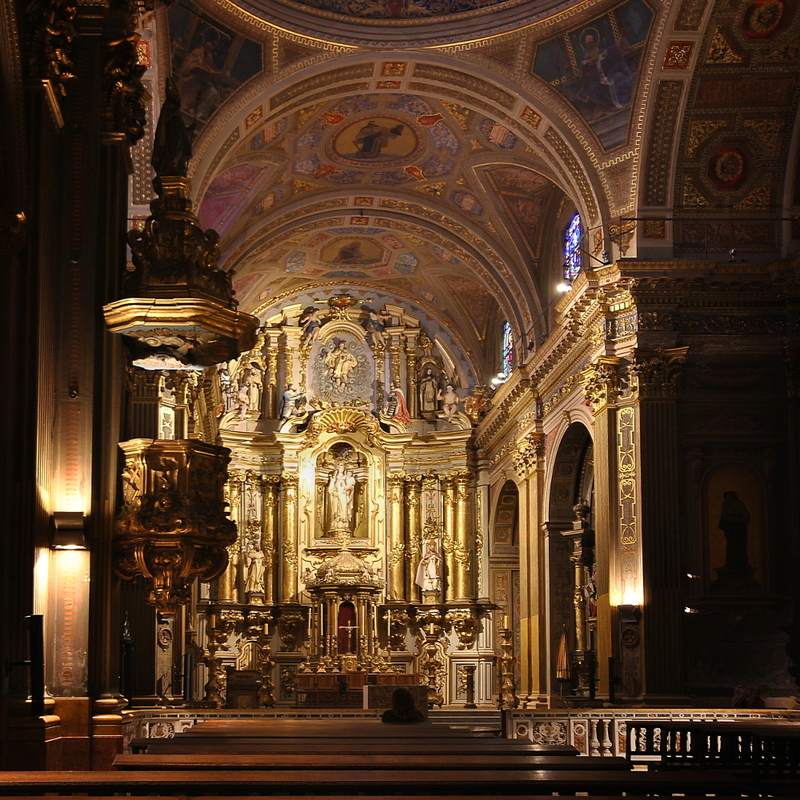 The architecture speaks to a time when people would spend extravagantly and immodestly (unchristianly?) on places of worship that would make it clear to all comers just how pious they were. The pattern is very prevalent to this day here in Chicago, were successive immigrant groups pool their money as a community and build a church of their own. (This makes for some curious juxtapositions over time as demographics change: Czech churches now with wholly Mexican parishes, and staid German Lutheran churches on the South Side redone as vibrant Southern Baptist or COGIC denominations.) 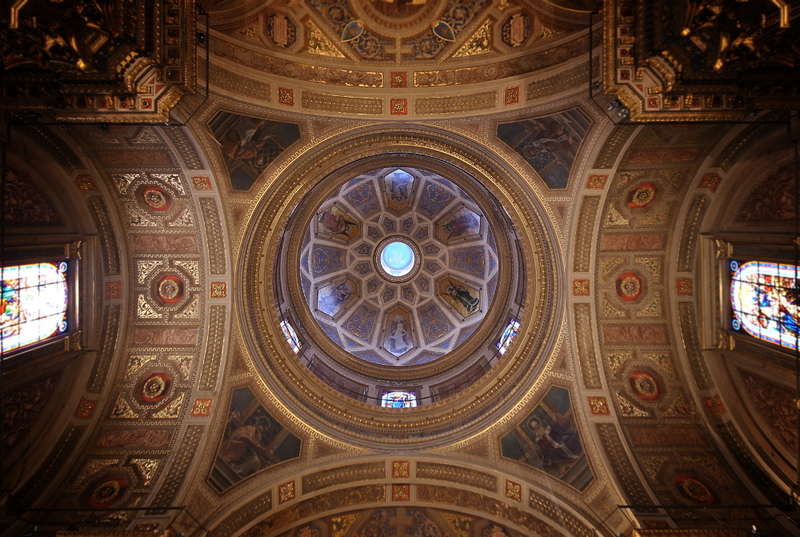 Buenos Aires is no stranger to this dynamic, as the beautiful Basilica de la Merced shows. 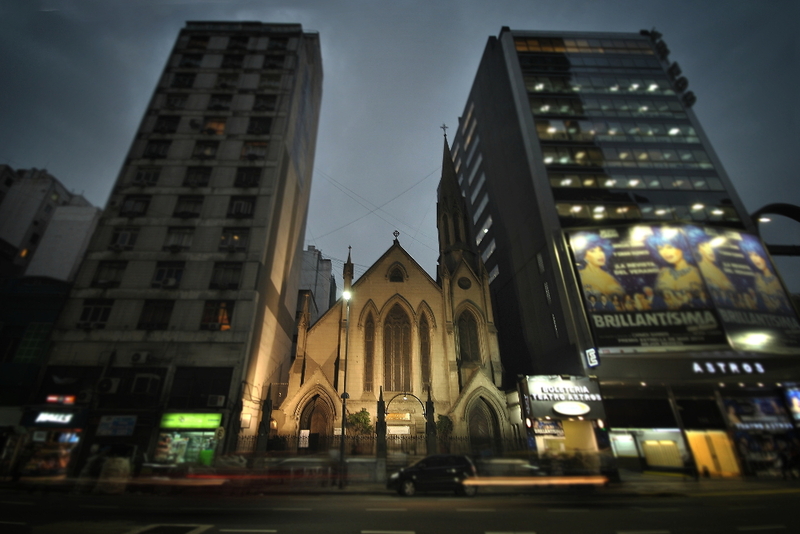 In the heart of the Centro, or downtown, this church is now surrounded by office and bank buildings. 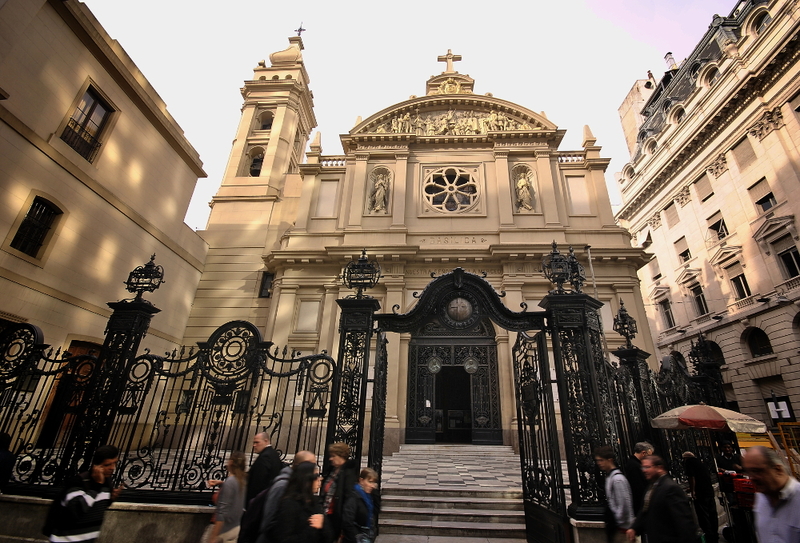 Though Argentina remains a staunchly Catholic country, I’m not sure how many people live close enough to this basilica to sustain a large parish. When I visited on a weekday, the doors were open, but visitors few. I was lucky enough to get the lone Porteño engrossed in prayer. When Byzantine emperors would build their churches in Constantinople, it was common to have a mosaic depicting the self same church being presented to Jesus or Mary by that emperor within that church. 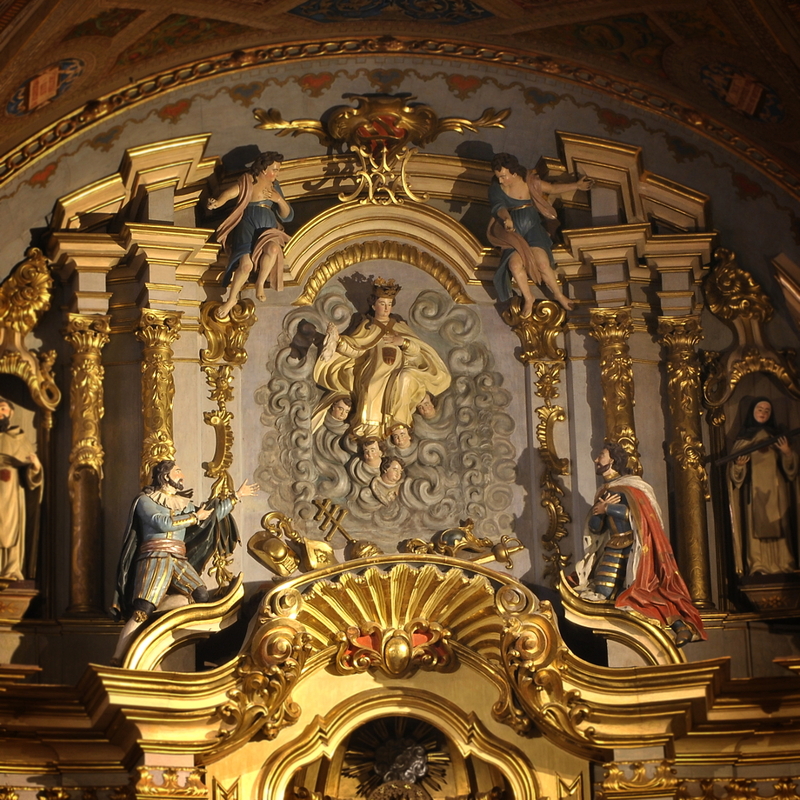 Though I can’t say for sure, it seems something similar is going on here with the two Spanish noblemen gesturing towards Mary within the altar. 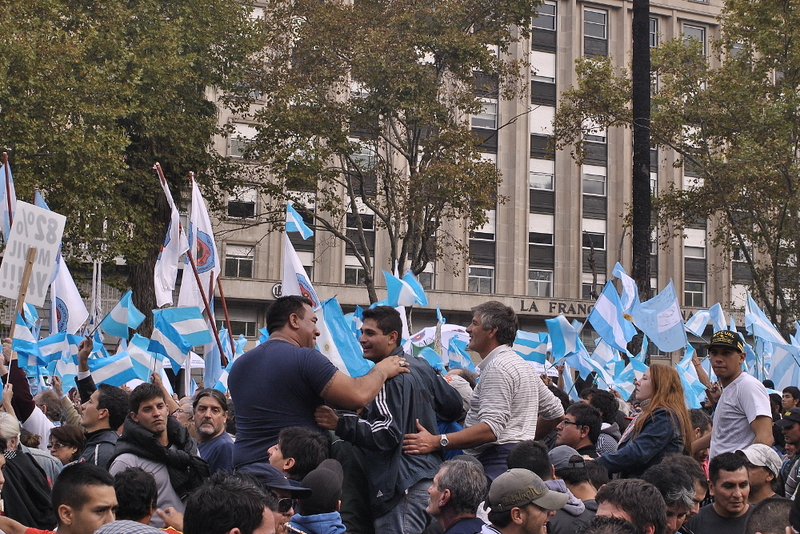 My general impression of Argentinians is that they love a good demonstration. 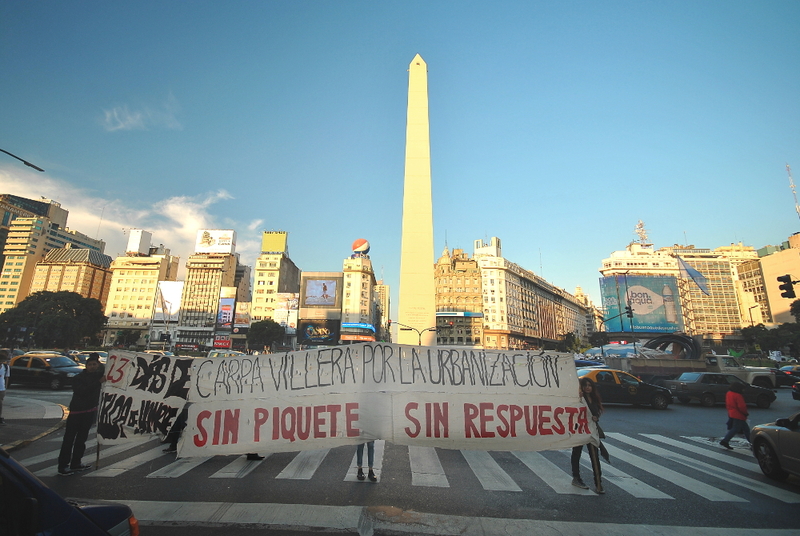 It could be that Buenos Aires, like any capital city, gets more than its share of them. I might have been there at just the height of protest season. 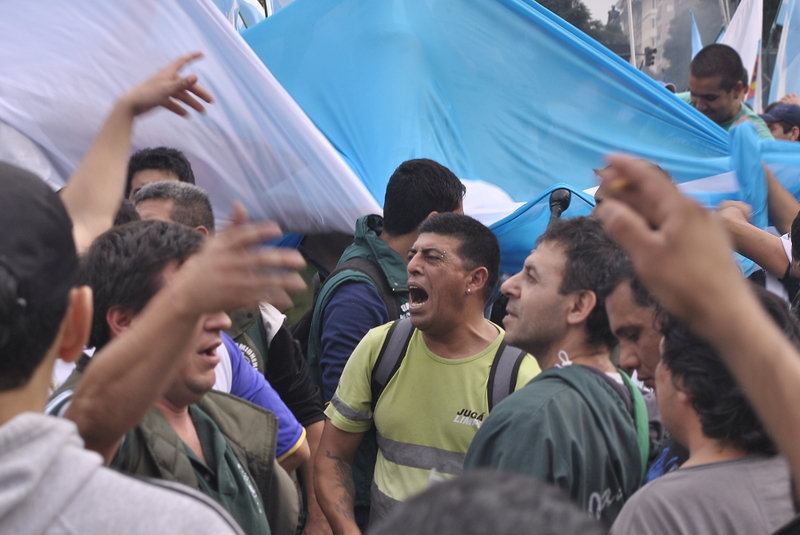 Whatever the case, it struck me how little impact these affairs seem to make; the locals treat the protests with utter detachment. I witnessed men in fine suits going about their business or talking on cell phones while chants and fireworks roared from a square less than a block away. Surely some of the causes behind these gatherings are worthy; it’s just that the people whose minds they may seek to change are suffering from acute protest fatigue. These people would unfurl their banner at red lights, then politely roll it up and return to the sidewalk before the light turned green again. 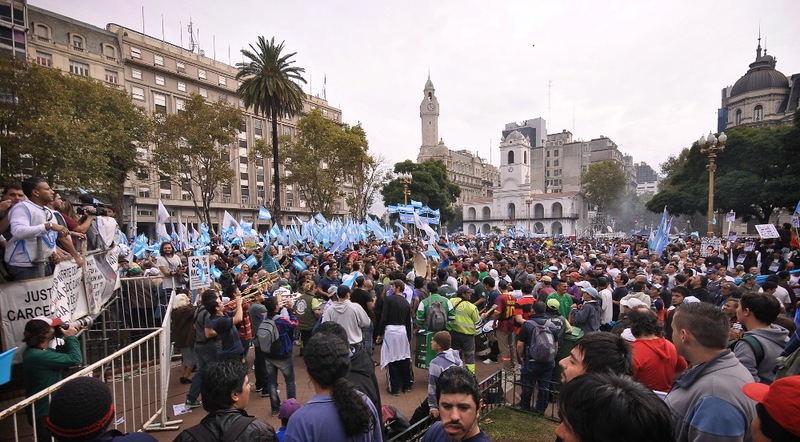 At the Plaza de Mayo, demonstrations were a daily occurrence. I staked out a spot on the edge of the largest one I saw one afternoon. 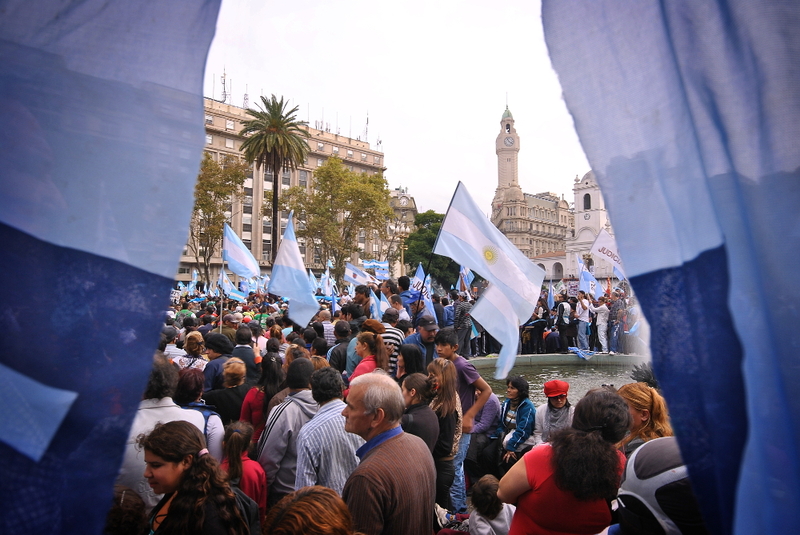 One thing I noticed with some dismay is the ethnic divide between protesters and the average Porteño (a Buenos Aires resident), the protesters being overwhelmingly indian or native, while the Porteños were largely of European descent. It goes to show that racial tensions are, unfortunately, global. 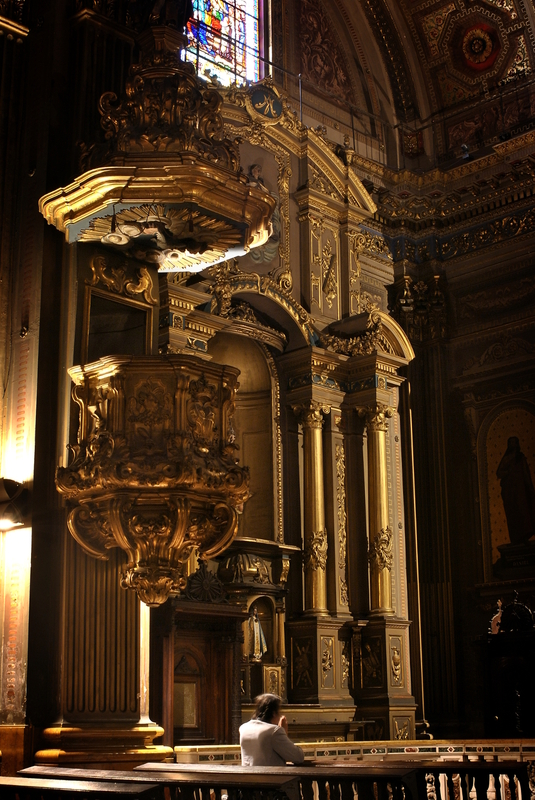 A bit of Rome sits in the heart of Buenos Aires’ bustling theater district. A little over 11 years ago I first met a sweet, quiet dog at the animal hospital I was working at. I loved her right away, she just wanted a kind word and a gentle pet but her owners mostly just ignored her except for her yearly vaccine visit which they merged with her yearly allergy flare up treatments. For 5 years she would come in once a year and slowly her story came out to us; the kids had found her wandering the streets and they convinced the parents to keep her. Only the kids were teens and never had a pet so they pretty much ignored her and the parents didn’t want a dog to begin with. They thought she was stupid and untrainable, she had poor house manners and would raid counters, garbage and the cat’s litter box at any opportunity. Six and half years ago, when the kids went off to college and the housing market collapsed right as her owners were trying to sell their house they decided it was time to euthanize her. She took to being a real house dog within a bout a week. She learned sit, come here, play dead and dance in about two weeks. She learned which cats would tolerate her and which ones wanted nothing to do with her. She climbed on my kitchen table, raided my garbage cans, pulled dishes out of the sink and stole anything food like that was left unattended for over 0.25 seconds. I learned that she was afraid to play with toys and wouldn’t touch them, she expect to be ignored all the time, she would eat until she was sick and then eat some more. She was gentle, sweet, goofy and delightful. She was also house trained. I also discovered she loved cats, despite my cats dislike and general apathy towards her. Give her a kitten and she would cuddle right up to them, groom them, play with them. Even more than humans or dogs, she loved cats. Over the years she helped me foster many kittens, including ones that had been pulled out of dumpsters. Kittens that had been dumped on the side of the highway used her as a jungle gym. Eventually I realized that I wasn’t imaging her googly eye, at some point she suffered some kind of injury or stroke and facial nerve damage that only made her cuter. We shared six and half years with each other. As often as possible where I went she went. She traveled to Detroit for an urbex trip with me, she made friends with every person she ever met and loved a good cookout. While her allergies never came back I discovered she had some GI issues that were manageable, but over the years they worsened even as her veterinarians were unable to diagnose her. Seven months ago she was diagnosed with kidney failure, her spinal arthritis was worsening and her liver continued to shrink. Kiska was my friend, my favorite annoyance, the best Big Sister a foster kitten could ask for and the last dog I will ever share my home with. I miss her terribly but am grateful for the time we had together. I am happy that her final years were with me, that she got to sleep on the couch and go for walks every day. This Monday I said goodbye to her one last time. If you are looking to get a dog, please consider adopting an older dog and giving them the life they should have had from the start. 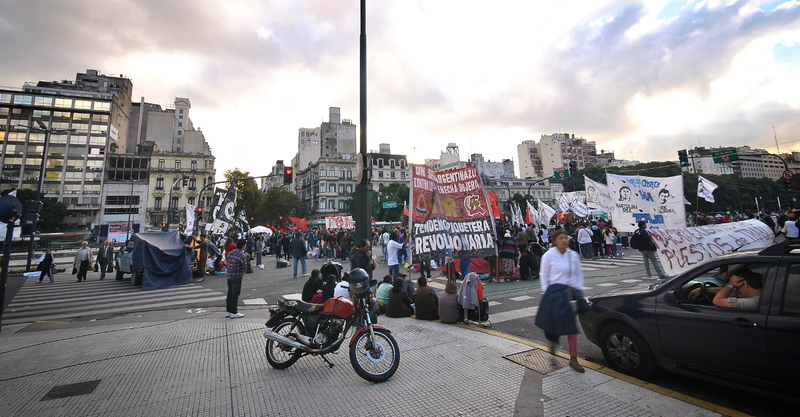 A mass of protesters blockade Avenida 9 de Julio, Buenos Aires’ central artery. 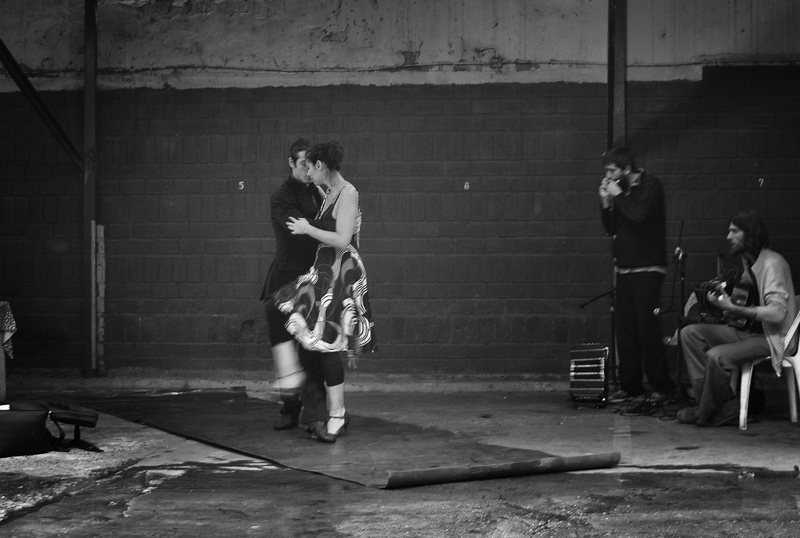 The tango originated in Buenos Aires, in what was (and still is) the rough-and-tumble neighborhood of La Boca. Unlike the blues in my native Chicago, which has atrophied into an Epcot presentation for tourists, the tango is still very much alive in Argentina. A common site are pass-the-hat performances like the one pictured here, where a young couple and a few musicians perform for passers-by, then literally pass the hat around periodically for tips. Of course, there are dance halls where one may try the dance oneself, but beware: the dance, as well as the attendant etiquette, is taken seriously. My dancing skills being as they are, I opted to enjoy this presentation from behind the safety of my camera.